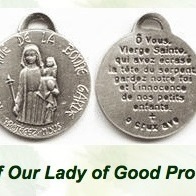 Scapulars of Benediction and Protection are now in stock! Non-Canadian customers, please call 1-888-598-2008 and leave your contact number so that we can process your order over the telephone with you. Now Available! A Unique Scapular for Our Protection. This scapular is to be worn hidden, as our Blessed Mother wore it, between layers of clothing. Made of wool and handcrafted in Europe according to directions originally given to Marie-Julie Jahenny. Imported. Actual size: 3 1/2 inches wide x 4 1/2 inches high. This scapular is an honored privilege offered by Our Lord and Our Lady to lead us through the terrible times when the world will face the Holy Wrath of God. Not only is the wearing of this scapular strongly recommended, but its exposition in our chapels and houses will give a very special protection. Please ignore the penny cost (a software malfunction) and CUT AND PASTE THIS ADDRESS FOR FREE DOWNLOAD: http://www.todayscatholicworld.com/marie-julie-jahenny-prophecy.pdf 78 pages. Author: André, Marquis de La Franquerie. This is the authoritative text on the Church-approved seer, mystic, and victim soul, Marie-Julie Jahenny. The first part of the book introduces us to Marie-Julie, whose visions began at 19 years of age and continued until her death. The rest of the book gives us the most important of the prophecies regarding these times that we are living through today. Recommended reading. 303 pages. A subject index is sent digitally to you so that you can find specific subjects more easily and compare the prophecies. This book is the most comprehensive collection of the more important prophecies put into an English translation. It is an excellent reference book on what is to come. Book order includes one digital subject index sent by email. Enjoy! “I desire that my servants, right down to little children wear a Cross. This Cross will be small and in its centre it will have, what seems to be like a little white flame. 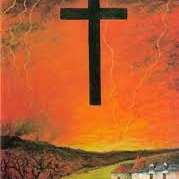 This flame will show that they are sons and daughters of the Light.” “My beloved, little friends, you will wear on yourself my adorable Cross which will protect you from all kinds of ills, big or small and later, I will bless them. 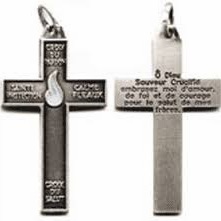 On the Cross, the following names will be engraved: --Firstly, “Cross of Pardon” --Secondly, “Cross of Salvation” --Thirdly, “Cross of Holy Protection” --Fourthly, “Cross to Calm Tribulations” --Finally, the following prayer should be engraved on this Cross, “O God, Crucified Saviour, embrace me with love, faith and courage for the salvation of my brothers.” This cross is manufactured in France, and is in French. The blessings attached to this cross are very unique. The Sacred Heart promised to Marie-Julie Jahenny that a dying person who kisses this cross with love and sorrow for their sins, or if they cannot kiss it, who merely holds it in their hands (with the same sentiments) will be saved from the eternal flames of hell. 60 pages. Compiled and printed by Isabelle Szczebura, the granddaughter of André, Marquis de La Franquerie. 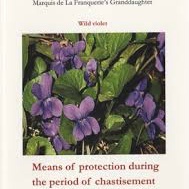 Chapter Topics include: Prelude to the Chastisements, Protection During Illnesses, Spiritual Advice, Summary of Prayers, as well as an Appendix. Everything that we need to know is in this book. It is a must-have for the coming Divine Chastisements. Recommended reading.